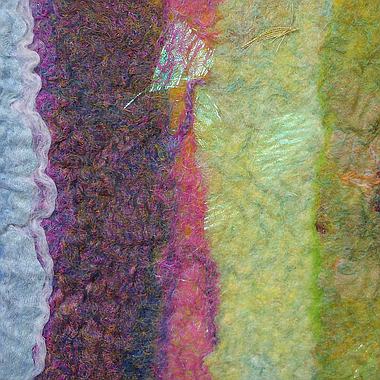 27 en 28 maart, Marks & Mixes: The aim of this course is to explore the effects of texture and tone through each stage of the felt making process. This will be achieved by mixing various fibers of silk, linen, seaweed, synthetics, etc with dyed wool tops by hand and different layering methods. Discover the many different subtile density and overlay of marks creating interesting patterns and textures in the transformation of materials. The work will initiate personal guidance and suggestions to recognise individual making process and ideas for future one off textiles, interior or fashion items. 30 mrt t/m 1 april, Colour for contrast: Discover the surprises of colour mixes and surface contrasts at each stage of the felt making process. To develop individual approaches and working methods, creating ideas for one off textiles, interior or fashion items. Exploring the proportion of colour using dyed wool tops can create various degrees of strong vibrancies or depths of grey. Additional fabric or threads can enhance the surface texture or change the structural qualities. Individual guidance will be available to extend ones personal approach and development.